Those of you who know me well can attest via the comments that this project is WAAAAAAY outside my comfort zone. Seriously. Way. Outside. I was having PTSD flashbacks to my sorority rush skit days and sorority sisters leaving in tears of frustration b/c my jazz hands just weren't JAZZY enough. (Cue: 'What I like about YOU' lyrics with "What I like about Chi-O" and me huddled in a corner twitching and moaning NOOOOOOOO). 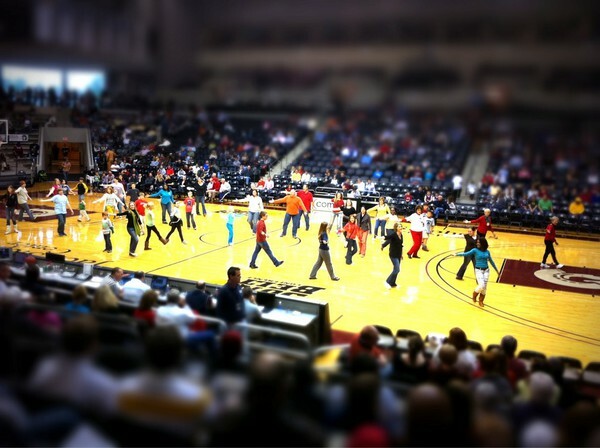 Sarabeth pretty much had to drag me down the stairs at the UALR basketball game shown above. After it was over, I was all high on happiness (just like running a 5K runner's high!) and joy. It's an amazing project and I'm so happy she invited me to be a part of it. I'm making Karl and Nate go with me this afternoon for our performance so maybe I'll come back and add some video later tonight. If you are in town and want to see the performance text me or email me and I can send you the super-secret location! it is kind of cool that you are in a flash mob! havent seen too much of that kind of thing here in t-town(ew, i called it t-town). It is TOTALLY AMAZING that you're in a flash mob. No way in HELL that I would be able to do something like that. On account of my PTSD. During rush skit practice senior year I KICKED the sorority sister on my right approximately 17 times. She was a pom girl, so my kicking ineptitude was not to be tolerated. She kind of hated my guts after that. Just so you know, I was supposed to be Britney Spears singing "I Love Rock'n'Roll" (substitute Hoops for Hope). To this day I can't hear that song without cringing. It actually makes my foot hurt. I have to tell you, Aubrey, that might be my favorite comment of all time. I was in a rush skit our sophomore year and...seriously someone had to stand in the back of the room and cue me when to go at like six different parts of the dance b/c I JUST DIDN'T GET IT! An eight count? What is that?! My work week assignments for the next two years? PAINTING THE STAIRS. That's how much they didn't want me to dance. Yes, that would be waaaay out of my comfort zone but hey it's good to push yourself some times. And I'm glad you've had fun - part of what I love about any big thing like this is seeing people decide to jump in...especially people as TOTALLY AMAZING as you! My work week assignment was usually painting the stairs because a pompous girl was in charge and she didn't like that I voiced my opinion about, oh, EVERYTHING. I'm not bitter though. In college, my sorority ASKED me to just mouth the words & not actually sing. I understand the ptsd.